A relief map showing the relative size and location of Olympus Mons, the largest volcano on Mars and in the solar system. Ancientwater may lie hidden within the largest volcano on Mars, researchers now say,and they speculate that such a setup could also harbor life. Whilethere is nofirm evidence that Mars does or ever has hosted life, one of theprerequisites would be water. The surface of the red planet is bone dry, butseveral studies have shown liquid water may once have flowed on Mars and couldstill exist in pockets below the surface. TheMartian volcano OlympusMons is about three times the height of Mount Everest, with gentle slopesthat sprawl across more than 150 miles of the planet surface. The widespreadvolcanic material suggests the presence of water-formed clay which can reducefriction — an effect seen on Earth at volcanoes in Hawaii. "Whatwe were analyzing was the structure of Olympus Mons, why it's shaped the way itis," said Patrick McGovern, a geophysicist at the NASA-affiliated Lunarand Planetary Institute in Houston. "What we found has implicationsfor life — but implications are what go at the end of a paper." OlympusMons soars 15 miles (24 km) above the surface, dwarfing the largest terrestrialvolcano, Mauna Loa, which is just 6 miles (9 km) high, including the portion ofthe volcano that extends underwater to the sea floor. NASA'shard-digging Phoenix lander uncoveredwater ice last year near the Martian North Pole. So some researchers thinkit's reasonable to suspect water that may lie trapped underneath the largestvolcano in the solar system, although many suspect that remaining water on theplanet remains ice-locked. McGovernand Julia Morgan, a Rice University geologist, used computer models to simulatehow Olympus Mons might have formed. They concluded that only ancient claysediments could account for the volcano's asymmetric shape. Anyexistence of clay sediment would certainly indicate water at some point, saidJack Farmer, an astrobiologist at the University of Arizona who did not participatein the study. But he cautioned that researchers would want to see more directevidence of clay underneath Olympus Mons — perhaps from one of the Marsorbiters currently eying the Red Planet. TheEuropean Space Agency's Mars Express spacecraft has in recent years foundabundant evidence of clay on Mars. 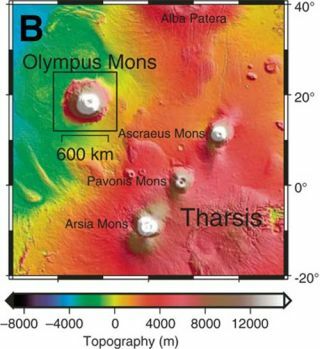 This at least supports a previous theorythat where Olympus Mons now stands, a layer of sediment once rested that mayhave been hundreds of meters thick. Whatmay be trapped underneath is of great interest, said the researchers. Fluidsembedded in an impermeable, pressurized layer of clay sediment would allow thekind of slipping motion that would account for Olympus Mons' spread-outnortheast flank — and may still exist in deep, trapped pockets within thevolcano. "Thisdeep reservoir, warmed by geothermal gradients and magmatic heat and protectedfrom adverse surface conditions, would be a favored environment for thedevelopment and maintenance of thermophilic organisms," McGovern andMorgan write in this month's issue of the journal Geology. Suchprimal organisms already thrive deep in Earth's ocean near geothermal vents.These and other seemingly extreme spots on Earth represent focal points forintense biological activity, Farmer noted. "Evenwithin an environment that might otherwise be rather dry, a point heat sourcein contact with subsurface water or water ice can set up a convection systemthat provides chemical nutrients to the near-surface environment, and maybe eventhe surface," Farmer told SPACE.com. Findinga currently active source of heat represents one of the future challenges. "We'dlove to have the answer to that question," McGovern said, noting evidenceof methane on Mars is considered by some to be another possible marker forlife. Spacecraft have yet to detect a true thermal event on Mars, such as amagma flow or active volcano. "Whatwe need is 'ground truth' — something reporting from the surface saying,'Hey, there's a Marsquake,' or 'Hey, there's unusual emissions of gas,'"McGovern added. "Ultimately, we'd like to see a series of seismic stationsso we can see what's moving around the planet."